7 August 2015 | Dark Heresy 2nd Ed. 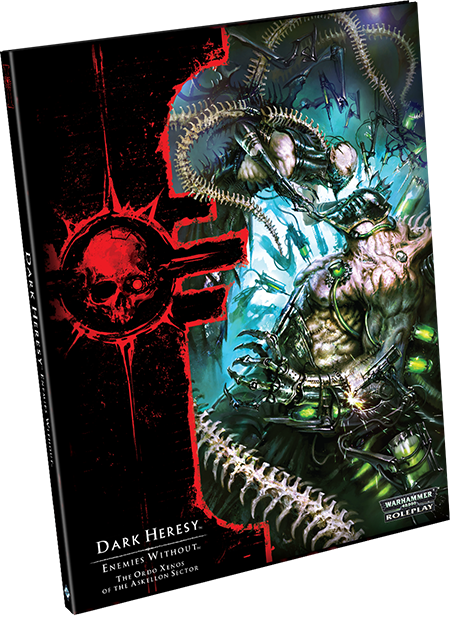 Fantasy Flight Games is proud to announce Enemies Without, a new supplement for Dark Heresy Second Edition! New threats gnaw incessantly at the borders of the Imperium. Despite countless righteous Wars of Purgation, the xenos threat grows in the Askellon sector. Unthinking Orks ravage countless worlds. The enigmatic Eldar slay innocents without reason or mercy. Dark Eldar take slaves to a fate worse than death, while the monstrous Tyranids devour a path wherever their Hive Fleets roam. These hideous xenos are an affront to the Emperor’s rule, and no true servant of the Imperium can rest while even one remains within the sector. Against these terrifying aliens, these unfeeling and monstrous beings, there stands only the bright shield of the Ordo Xenos. These noble hunters of the Inquisition safeguard the worlds of the Imperium, protecting thousands of human lives from horrors as obscene and perfidious as any daemon spawned from the Warp. 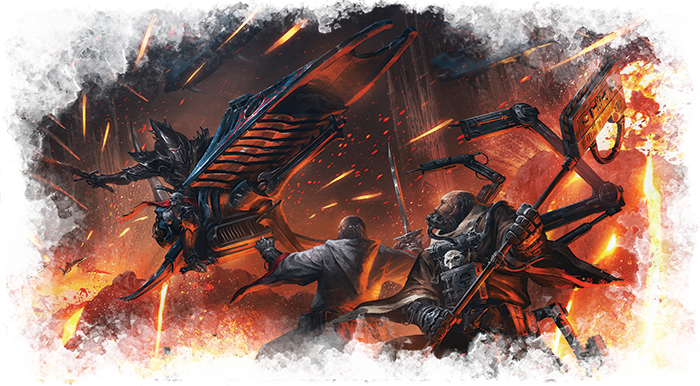 Now, with the Enemies Without supplement for Dark Heresy Second Edition, you and your fellow Acolytes can take your places as members of the Ordo Xenos and stand against the heresy brought by these aliens from their strange stars. In Enemies Without, you’ll find a host of details on the xenos species inherent to the Askellon sector. Whether you’re turning aside a host of blood-hungry Orks, defending humanity against Kroot expansionism, or batting the biologically-engineered killing machines of the Tyranids, Enemies Without gives Game Masters the information they need to bring these xenos species to life in any investigation. 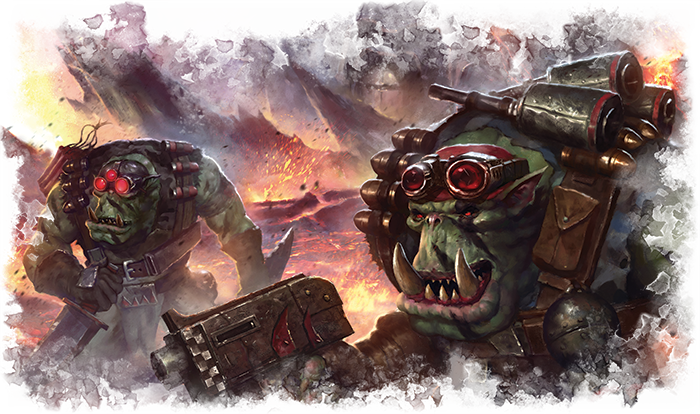 It’s not just the living alien races that pose a threat to the Imperium’s safety though. The Askellon sector is old, almost beyond measure, and riddled with the remains of lost civilizations and forgotten xenos cultures. Even when their occupants are long dead, the cities and holy places of these deceased xenos can prove deadly. Dark relics and proscribed artefacts from these ancient places may spread heresy and corruption, even while arcane texts open the door to the spread of Chaos. These same relics have inspired a massive underworld business – the Faceless Trade. Members of the Faceless Trade acquire and sell these xenos artefacts, spreading heresy into the cities of the Imperium as surely as any vile cult. 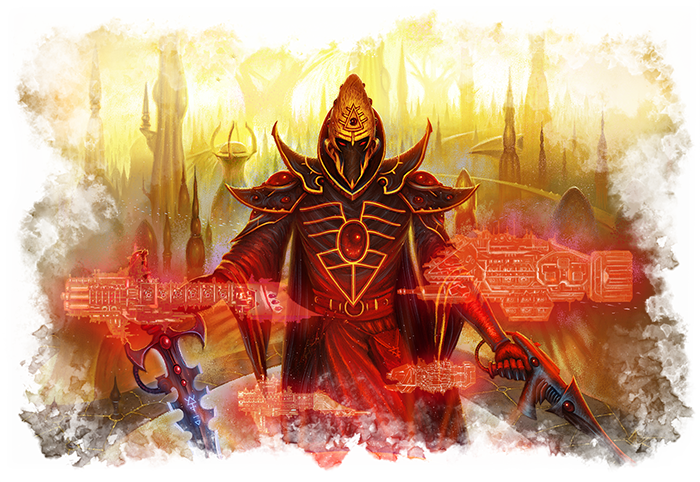 You and the other Acolytes of the Ordo Xenos must find and stop the Faceless Trade wherever it manifests – in addition to destroying all traces of the xenos races in the Askellon sector. For the more radical Acolytes among you, an expanded armory offers a host of xenos weaponry for you to examine, research, and perhaps use against its owners. Alongside digi-weapons and Desoleum Power Blades, you’ll find Shuriken Catapults, Kroot rifles, and a collection of weapons made by no xenos yet known in the Askellon sector. The most radical Acolytes may even fight fire with fire by hiring bands of xenos mercenaries to combat greater threats! Enemies Without brings more than an advancing tide of foul xenos to test your resolve. It also equips the warriors of your ordo with new vehicles for any situation. For the first time, you can pilot aerospace vehicles to engage in aerial combat, long-range reconnaissance, or transport to voidships. In addition, you may drive off-road in an Aelurus Heavy Trike or attack the foes of the Imperium in a heavily armoured Sentinel walker. Naturally, with a focus on new and powerful vehicles, you or one of your fellow Acolytes may want to focus his service on driving, maintaining, and fighting in vehicles. To this end, Enemies Without introduces a new role for Acolytes to take: the Ace. As the Ace, you’re an unparalleled pilot – more at home in the cockpit of a vehicle than outside. Whether you’re tracking a Dark Eldar raiding party at high speed or gunning down swarms of Tyranids, the Ace can be a crucial addition to any group of Acolytes. With a new role, new home worlds, new backgrounds, and an armoury full of new weapons – both Imperial and xenos in origin – your Acolytes will be well-equipped to battle the countless threats that assault the borders of the Imperium. Your quest will not be easy. For every wicked xenos creature slain in glorious battle, three more slip past your defenses into the undefended regions of the Askellon sector. Your vigilance must be constant; your justice must be merciless. Join the Ordo Xenos. Look for Enemies Without at your local retailer in the fourth quarter of 2015.